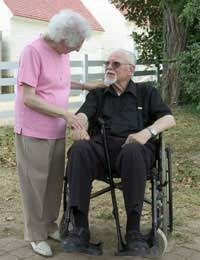 Home > Mobility Equipment > Do I Need a Wheelchair? If getting around is becoming a big problem for you, a wheelchair may be the best solution for you on a long-term basis. Not everyone is eligible for a wheelchair though - in most cases, you need to be temporarily or permanently disabled to qualify for one through the NHS Wheelchair Service (rather than be suffering from age-related mobility problems). However, the NHS Wheelchair Service will determine if you qualify. Most of the NHS Wheelchair Services are overseen by local authorities, and the way in which their services are run tends to differ according to the local authority in question. Because of this, the criteria for eligible for a wheelchair isn't necessarily consistent across all NHS Wheelchair Services. If you're eligible for a powered or manual wheelchair through the NHS Wheelchair Service, you need to be referred to the service, either by yourself or by a medical professional such as a doctor, hospital, consultant, physiotherapist or occupational therapist. They will review your referral and assess your individual needs and circumstances to make sure that firstly, your circumstances warrant being allocated a wheelchair, and that secondly, that you're given a chair that suits your personal circumstances or a voucher that covers some of the cost. The person that made your referral should hear back around a week later. Assessments usually take place between two and four weeks after referral. These will usually take place at an NHS Wheelchair Service centre. If you're struggling to reach the centre, your local social services department can help you with getting there. However, it's worth pointing out that assessments won't always be conducted, as a lot depends on the budget for that particular year. Repairs and maintenance of your wheelchair should also be discussed. The timescale for receiving your wheelchair varies according to the type of wheelchair and where it is ordered from. It can take anything from two weeks to several months. The NHS Wheelchair Service should be able to advise on this after your assessment. Your wheelchair will be formally given to you, either in your own home or at an NHS Wheelchair Service centre. At this point, you'll be given a full safety briefing, plus information about insurance, repairs and maintenance. If your circumstances change (for example, if your condition begins to get worse), a re-assessment can be arranged. It's possible to hire or buy your own wheelchair without going through the NHS Wheelchair Service, but this will only be a bog-standard wheelchair that isn't suited to your personal needs. The main benefit of using the NHS Wheelchair Service is the individual assessment (that usually takes place) to decide which type of wheelchair will work best for you.